Sometimes you can find beauty in the most unexpected places. I was struck by the beauty of a humble set of chairs next to some ancient chipped pillars. Became a dazzling thing of rainbow beauty. For more everyday miracles, please visit: Our World. 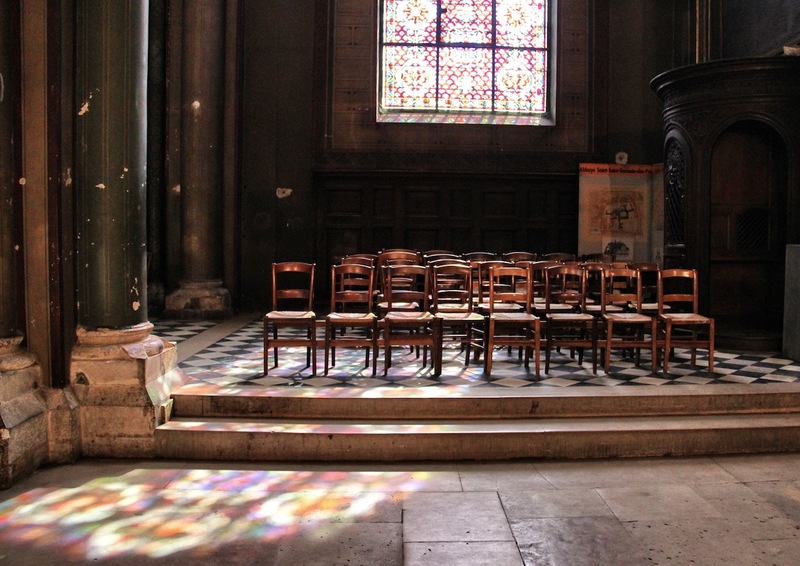 Posted in photography, TravelTagged beauty, Eglise Saint-Germain-des-Pres, humble, oldest church in Paris, Paris, rainbow, simplicity, unexpectedBookmark the permalink. I LOVE these photos! So serene and the colors are subdued. Very nicely done. Lovely and thanks for sharing such a beautiful and historic place. What fantastic captures!! Miracles they are indeed! Such a beautiful, historic place indeed! Thank you for sharing and what a great start for my day!!! WOW!! These are gorgeous. I love your talent. Love these. I have a “thing” for stained glass. When least expected we’re given gifts. I am looking at these photos as I start a rainy/snowy day. Your images provide a rainbow for me to remember. Love the “rainbow” from the stained glass ~ beautiful photos! Fantastic! We can see beauty everywhere if only we can open our eyes to the unexpected..
so beautiful ..and it reminds me of my friend Lauren’s church in Norwalk, CT! Oh I so agree…the reflection of colors breathtaking…you gave me visual joy as usual! Great photos! I love the soft colours on the floor! The colors on the floor are amazing! What a beautiful place. Exquisite! Such a wonderful scene to photograph and you captured it perfectly. I’m really loving all your photos from Paris! Yes, neatly arranged, I liked the pattern and the lighting. The colored reflections from the glass splashed on the chairs and floor are simply delightful! You have an amazing eye! Those pictures speak volumes indeed. Great pictures. Colored lights playing on the floor is very beautiful. Stained glass always looks its best with the sun shining through it, casting glories over the space inside. It’s indeed a visual treat 🙂 beautifully taken. Light through the stained glass makes it look more devine. Brilliant shots! Great job on the chairs and light (reflections). 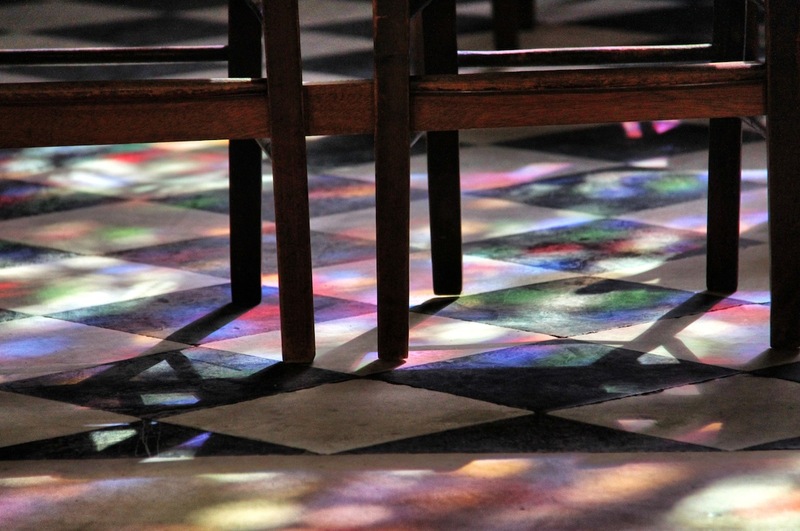 The stained glass reflected on the floor is very beautiful. I use your own words… everyday miracles! Stunning photos! I love all your Paris’ shots! Stunning! This place & all it’s architectural wonder are amazing – but that light really creates something spectacular! These photos are stunning. I especially like the rainbows on the floor. Hur snyggt som helst, awsome Picture …. Oh that is a miracle! I couldn’t stop looking at the floor even in the pictures. It must have been terribly hard to tear yourself away from the real thing. Again, your eye for beauty is extraordinary. Thank you for sharing! It’s those unexpected small things that sometimes have the most impact! Just lovely! A beautiful mosaic of reflected jewelled colours surrounding aged timber chairs … simple yet profound. I love how the colours on the floor seem to have intensified from the colours in the window! Magical!! Wow, I like the colorful patterns and reflections on the floor! Oh wow, lovely captures of the rainbows and reflections. Wonderful captures! Have a happy week! I love the idea of rainbows being hidden everywhere, like little pockets of happiness. floors pf heaven awash in colored light! You have a wonderful eye. You see the beauty that many would miss. Thank you for sharing these lovely images. you’ve a great eye. such beautiful rainbows. Ancient always has its own charm! How equisite. Thank you for bringing this miracle of light to us. They are magnificent photos. I love old churches as they convey such a sense of calm and reflection. The muted colours from the windows spread across the chairs and floor are too beautiful for words. Such good captures- I love going to small ,old churches. Even in big cities everything suddenly becomes quiet and peaceful.Thanks! What a moment of beauty! You’ve captured it so wonderfully. Beauty can be so fleeting and that’s precisely what makes it so precious. I bet it changed in a moment. Wonderful images, Fiona. Really lovely, better than carpet. Awesome… words struggle to praise the beauty, enhanced through colors reflection! Very interesting how you’ve managed to capture the light from the windows on the chairs! Wonderful images from inside the church. The chairs look great. I love the rainbow splashes across the chairs and floor. Great pictures! Very nice light – I used to see a similar effect on York Minster. I used to walk though it everyday on the way home from a teaching practice! Surprises surprises in places least you expect them!! those are neat antique chairs!! Thanks for dropping by my blog btw! Your eye went straight to the spirit of the place and your camera captured it. Perfectly wonderful! Truly beautiful!!! And so simple!!! I love the whole idea that such a small thing is one of your best memories from such a huge city!!! There’s no way that images like these could ever be eclipsed Fiona. So much history within those walls, living in a young country like Australia, scenes like these take my breath away. “The most astonishing thing about miracles is that they happen.” And I’m grateful to those who find the miracles (which I might miss) and share them with us like you, ladyfi. Oh My! Your photos are truely wonderful. Helt underbar plats, som jag aldrig besökt. Ljuset är sååå vackert. Gillar kontrasten med de enkla stolarna och den magnifika inredningen. Jag kan verkligen förstå att du älskar den här platsen. Ska komma ihåg den nästa gång jag kommer dit. I like the rhythm of the chair legs. Well done! Lady, les photos sont magnifiques!! And I can certainly see why these photos of chairs in a church are some of your favourites, Fiona. Beauty in the simplest of things can be breath-taking. And these are that. Lovely pictures! That last one is spectacular. There is life and a long story in this post. Thank you! 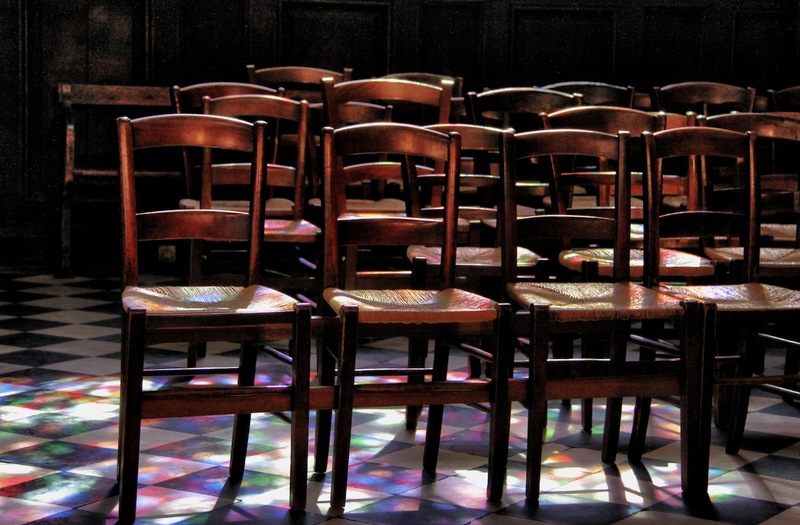 Fabulous post in such a wonderful old church.. Love the colors on the chairs and floor by the stained glass window… Awesome. So glad you were there at the perfect time! If you had been 2 hours earlier or 2 later these shots would not have happened! What a cool scene, indeed. It’s very nice space. Where others just saw stained glass, you saw jewels. Nice place. The light is very beautiful. An ideal place to pray. Fantastic perspective and beautiful warm tones. Great shots! Congrats on being selected Post of the Week! Came back to say congrats on the POTW!! You were lucky to be there at that right moment…lovely colors.